Nuru massage ny new york nuru therapeutic massage. Guilin Middle School(GLMS), located at the foot of the picturesque Elephant Trunk Hill, in Guilin ,a beautiful city rich in natural wonders and a well-known city of tourist attractions with historical relics and a unique landscape of hills and rivers, is one of the provincial key schools directly affiliated to the Guilin Education Committee, covered a floor space of 4 hectares, with a construction area of over 25000 square meters. The school now has 1642 students and classes. It is a time –honored key school originating from the Confucian Study founded in 1905, and regarded as one of the three most prestigious schools in GuangXi Province over the last reign of Qing Dynasty. In 1913, it was formally named GuangXi Guilin Middle School and Guilin City Middle School . Five years later in 1918, it was officially renamed No.3 Provincial Middle School. 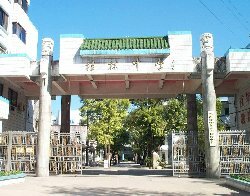 In 1931, the school was administratively divided into two parts: the primary and the senior, and merged to form Provincial Guilin Middle School in 1938.It was in 1956 that the school was finally promoted to Guilin Middle School under its name now. After many years of creative endeavors, the school has grown to become a fully accredited key school at provincial level that offers many basic and applied disciplines of liberal arts and natural sciences in normal education . So the school has won numbers of state-level awards for its fine tradition of emphasizing good foundation, high quality and effective management in teaching. Early in the 1950s,the school was designated an educational reforming experiment key school issued by the Ministry of Education of the State. In 1978, it was again registered as one of the state-level key school and has been selected into the various education dictionaries ,such as “A Big Dictionary of China Famous Schools” “ Chinese Famous Middle Schools”, “Famous schools In China” for its spirit, teaching characteristics and the fine academic atmosphere. CAMPUS NETWORK From 1999 to 2001, the school has invested more than four million yuan to build its home-page campus network directly connected with the Internet ,two electronic reading rooms opening freely to the students, a video supervising system connected to all classrooms, an interactive multimedia teaching system based on the campus network, and has realized the multimedia teaching of common basic courses. As a result, the school administrative management and examination datum transmission have been carried out with the paperless assignment .Now every class has its home- page . An " audio-visual education system "is universalized completely in the school . With the establishment of information banks of teaching reference and examination , highly enjoying teaching resources has been realized in the school, hence, management standard and teaching quality are constantly raised in an effective and regulative way. SCHOOL LIBRARY The newly expanded school library, composed of a reference , resource ,and reading hall , occupies 2400 square meters. It has a collection of more than 100,000 volumes, supplemented by more than 300 periodicals of which over 86 are in foreign languages . It runs its own language labs, electronics reading rooms, microcomputer rooms , gymnasium as well as some special rooms for technical and art ability inside the comprehensively modernized multi-storied building for study and research. ACHIEVEMENTS IN TEACHING In the course of its development from Confucian Study to Guilin Middle School, this time-honored key school has committed itself to fostering people of great talent for the society and has produced large numbers of outstanding figures, among its prominent students are Huang Xuhua, a member of the Chinese Engineering Academy, who is regarded as Father of China nuclear-powered submarine；China’s pioneer in remoting science , a member of Chinese Academy of Sciences Tong Qingxi; an international famous discoverer of Lei Theory , a member of the Chinese Academy of Sciences Lei Xiaolin; Chinese high –energy physicists Lin Ning and Xie Hegeng. According to a rough survey, the graduates body from this school totals more than 40,000. Over a long period of running school, it has followed the orientation of democracy and humanism education ,implemented the academic democracy, protruded scientific teaching research, carried forward the fine cultural tradition, and taken pains to enhance the teaching quality and educational effects, special stress is also laid on the national college entrance examination. In the past twenty years, the average of entrance examination to university has arranged the first three ranks in the province, 12 students won the honorable title of Number One Scholar, 12 for the second and 8 for the third in the total marks in GuangXi . Excellent achievements in the all National Olympic Competitions in Math, Chemistry, Biology and Physics are also considerable from 1999 to 2001, 52 students are awarded the first prize ,66 for the second prize and 112 for the third prize in all. ACHIEVEMENTS IN RESEARCH The school has made remarkable achievements in teaching scientific research .Since 1988, it has registered 11 teaching reform projects, 3 of which have been listed in the national program. By the year 2000 ,6 teaching reform projects had won awards at the provincial level,3 of which were cited as First Award, 3 projects won awards at the national level, ranking first among all the schools in Guangxi. In the year 2001, evaluation of teaching achievements in Guangxi, the school ranked again among the provincial schools in the number of first and second awards. In recent two years, the school has made great achievements in scientific research totaling over 21 items, of which there are 23 volumes of academic works, 127 academic papers published in journals at the provincial level and higher, and 11 items awarded by authorities at the provincial level and higher. Many of the scientific achievements have been applied by deepening its reforms of educational system. As a result, the Morality Education, Implementing practice of Physical Education, the Traditional Virtue Education, GuangXi Network Trial School have been cited as “advanced units” and “excellent schools” by China’s Ministry of Education, as well as the National Physical Committee and Provincial Education Committee. In 2001, the school was conferred the title of Model School of Modern Technology Education with the approval of the Ministry of Education. TEACHING STAFF The school has a staff 134 and has attached great importance to the structure of teaching staff, especially to the professional recognition of academic leaders and talented scholars in the various branches of learning, of the 115 full-time teachers, there are 61 senior teachers and 34 middle- graded teachers, the average age being 37. Among the teachers, two hold special classification; twenty two holding master’s degrees and higher, accounting for 19% of the total, higher than 10.2% provincial average; seven are appointed to the 21st Century Gardeners Project in GuangXi. Jiang Pin, Principal of the school, including the other four teachers, has become a member of the National Training Center for 100 famous high- schools designated by China ’s Ministry of Education . The school also houses the Guilin Center of Provincial Education Network, GuangXi Center for training B- graded Mathematical teachers of the 21st Century Gardeners Project. With a strong professional force, the school has formed its guiding educational principle and target of development to build the Guilin Middle School into one of China ’s first- class open and research-oriented school with considerable influence, unique characteristics in China .